Wrist pain is typically caused by overexertion of the wrist. It can cause you to experience pain, numbness, decrease in strength or decrease in motion. Common wrist ailments include sprain/strains, carpal tunnel syndrome, ulnar nerve entrapment, fracture, and Kienbock’s Disease. Wrist pain is sometimes caused by a sudden injury or arthritis but the most typical wrist pain is caused by overexertion or repetitive movements. One major condition, carpal tunnel syndrome (CTS), has been associated with repetitive hand movement leading to nerve pressure. Pain, numbness, decrease in strength or decrease in motion are all common problems associated with overexertion and repetitive movements. Proper treatment for the wrist is not a “one-size-fits-all” answer. It is important to determine the source of the pain and your treatment will depend on the cause and severity. Scheduling a comprehensive exam of your wrist before you begin any treatment plan is key to the success of that plan. Wrist pain can be debilitating and should be addressed immediately so that chronic problems do not persist. Advanced Chiropractic & Rehab, Inc. is the smart choice to better health in the Youngstown / Mahoning Valley area. 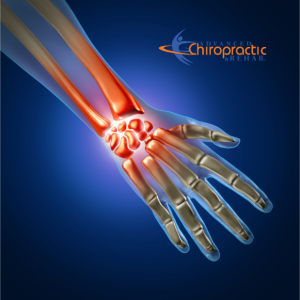 We have the knowledge and experience to help patients recover from most wrist problems.